Home / Nedim Malovic / Parody / Shinder / Tinder / trade mark opposition / Shinder, Shinder, Shinder … will you ever be like Tinder? Shinder, Shinder, Shinder … will you ever be like Tinder? Move on Tinder: there is a new dating app on the market, conveniently named Shinder. Katfriend Nedim Malovic (Sandart & Partners) looks into the IP implications of this genius entrepreneurial/'romantic' idea by Shed Simove [if you are wondering who that is, here is his website]. “Shed Simove, a British author, performer, self-proclaimed motivational speaker and entrepreneur has successfully created his own web-based dating app where you get one chance to swipe right on just one man: Shed Simove himself. The app specifically targets women, although men can also sign in. However, men who try to match with Mr Simove are greeted with a brief message informing them that Mr Simove prefers dating women. The idea of a Shinder app came after using other apps. Mr Simove tried to come across as quirky as possible on other dating apps to attract better matches (this smells of too many left swipes), but had little luck. 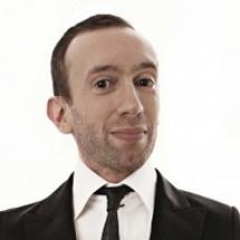 Mr Simove employed several techniques, including: photoshopping a Tinder photo of himself bursting out of a Kinder Surprise egg (“Tinder Surprise”) [should be swiped right just for this]; and making a “Bumble pick of the month” logo (“No one cared”). All this until he decided that he needed to adopt a different strategy: Shinder was thus born. Shinder works in a way similar to Tinder (apparently it also employs an algorithm similar to the one of Tinder): you set up a profile and get to swipe. If users swipe left, the app tells you “You dodged a bullet there, Shed is extremely high maintenance.” If you swipe right, the app promises to notify you if it’s a match. If Mr Simove likes you back, the app opens up a dialogue between the two parties. A blatant trade mark infringement… or not? The first IP implication of all this is the use of Shinder as the name of the app: can something like this be tolerated in a Tinder-dominated trade mark world? A simple trade mark search reveals that Tinder has filed and obtained an international trade mark registration for territories including the EU and the US. There is therefore a 'Tinder' trade mark registered for services in classes 9, 42 and 45 of the Nice Classification. 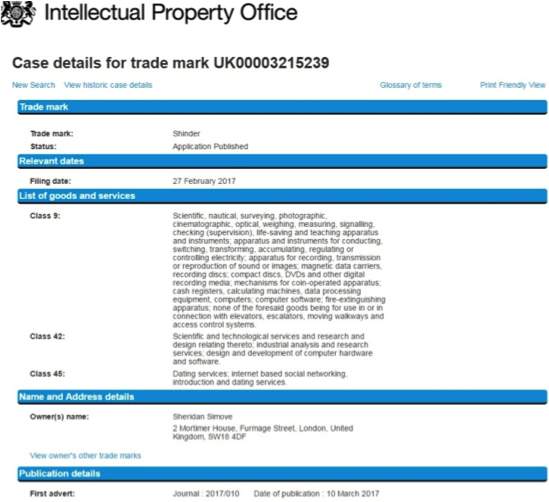 As the UK IPO trade mark database promptly reveals, a while ago Mr Simove filed a domestic trade mark application – for 'Shinder' for services in classes 9, 42 and 45 of the Nice Classification. This brings into consideration whether Tinder (arguably also a trade mark with a reputation) may successfully oppose the application on the basis of a conflict with its own registered trade mark (Tinder has indeed opposed the application). The Tinder and Shinder signs are phonetically and graphically similar, although the sign above the letter “i” is a small flame for Tinder and a devil’s silhouette for Shinder. Another noteworthy feature is the colour of the logos, both in not so dissimilar shades of red. In addition to the similarity of the signs, both signs are also used for identical services. There seems to be indeed a serious likelihood that Tinder’s opposition (already filed) will succeed. In addition to the opposition aspect, should Mr Simove use his ‘Shinder’ sign in the course of trade, could Tinder also succeed in an action for trade mark infringement? Also here the answer appears to have an answer in the affirmative. A question that might be raised is whether Mr Simove could successfully argue that Shinder is a parody of Tinder. At the moment there is no statutory defence for parody at the EU level, despite the timid opening made by the new Trade Mark Directive and the Trade Mark Regulation as revised in 2015. The reason for a non-existent parody defence under trade mark law may be that a sign that distorts one that has been registered as a trade mark may take unfair advantage of its distinctive character and repute. This is at least what the German Bundesgerichthof thought in its decision of 2 April 2015 - I ZR 59/13 - Springender Pudel (see here for a summary of the decision). The eminent risk of allowing a parody defence seems to be that the defendant might profit from the similarity of his and the trade mark owner’s signs to attract a level of attention for his products that it would have otherwise not been able to have." It's a great marketing parody - who on earth convinced this man to file a TM application for it? Look for discussion on "Schmazi? "!